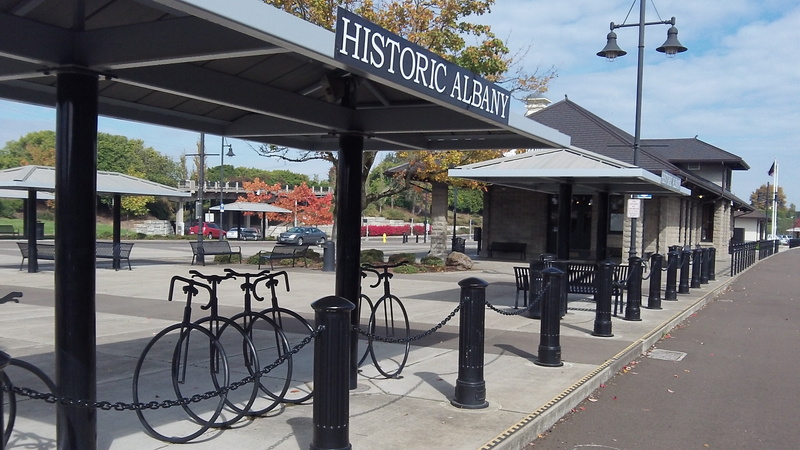 » Bypass Albany Station? Better not! Bypass Albany Station? Better not! Albany Station during a lull before the arrival of Amtrak’s Coast Starlight, No. 14, northbound, on Oct. 10. Albany Station, constructed at great public expense, is a hub of transportation activity during some parts of the day. Trains and local and regional bus lines stop there, and there’s plenty of convenient parking for taxis and the vehicles of commuters and other travelers. And yet, incredibly, two of the alternative routes being considered for future passenger rail in the Willamette Valley would bypass Albany Station, one of them in order to have intercity trains stop in Corvallis instead. The Oregon Passenger Rail project has made public four alternate routings for increased passenger service between Eugene and Portland. Luckily, according to Albany Mayor Sharon Konopa, using the existing Union Pacific mainline seems to be the top alternative. But the second and fourth would skip Albany and build new stations, not to mention lots of new track, elsewhere. One, apparently the lowest-ranked one, would run trains through Monroe and Corvallis, bypassing Albany Station on its way north from there. ANOTHER MEETING: A mid-valley advisory group on the rail project will meet from 6 to 8 p.m. Tuesday, Oct. 15, in the Calapooia Center at LBCC to discuss the results of the evaluation of the alternative train routing proposals. This is the problem with reporters who have a stack in the matter, they tell the story from the point of view of their feelings rather than actually looking at the facts and reporting those. Oh wait, that one actually works!